Traditions at Desert Creek in Green Valley, Arizona is an age-restricted community that welcomes homebuyers aged 55 and better. With just under 200 homes, this close-knit community offers the intimacy of a small neighborhood with the lifestyle of a world-class resort. Residents of Traditions at Desert Creek enjoy plentiful amenities offered by Green Valley Recreation. Situated in Southern Arizona, this Pima County community is situated in a convenient location with excellent views of the Santa Rita Mountains. Traditions at Desert Creek s homeowners pay dues to access all 13 facilities offered by Green Valley Recreation (GVR). GVR s members have full use of numerous fitness centers, ballrooms, hobby rooms, meeting rooms, and restaurants. With GVR s 17 tennis courts, 13 heated swimming pools, and 52 shuffleboard courts, it s easy to stay fit and active while living in Traditions at Desert Creek. Other amenities provided by GVR include computer labs, arts studios, dance studios, fishing lakes, parks, and RV parking. D.R. Horton began construction of Traditions at Desert Creek in 2007. The community sold out in 2014 and offers homes on a resale basis. These reasonably priced homes offer six floor plans with 1,198 to 2,161 square feet of living space. Traditions at Desert Creek s ranch homes offer one to three bedrooms, two bathrooms, and an attached two-car garage. Additional features include a den and private backyard. The modern homes are designed with some of the latest trends and styles favored by active adults. Some of the homes have open floor plans offering expansive great rooms and gourmet kitchens. The community activities and entertainment venues of Green Valley Recreation provide the residents the opportunity to lead a socially active and culturally rich lifestyle. A host of restaurants, ballrooms, theaters and auditoriums provide great entertainment nearly any night of the week including musicals, plays, theater and dances. Plus, there are over 60 clubs and interest groups in Green Valley that include everything from tennis, hiking and golf to cards, crafts and dancing. Traditions at Desert Creek is perched on the west side of Green Valley in Arizona. The captivating location offers superb views of the distant Santa Rita Mountains and the valley below. Yet, just minutes from the this quiet retreat await the magnificent lures of Green Valley that include great shopping and dining destinations plus world-class recreation centers offering an unparalleled social environment. 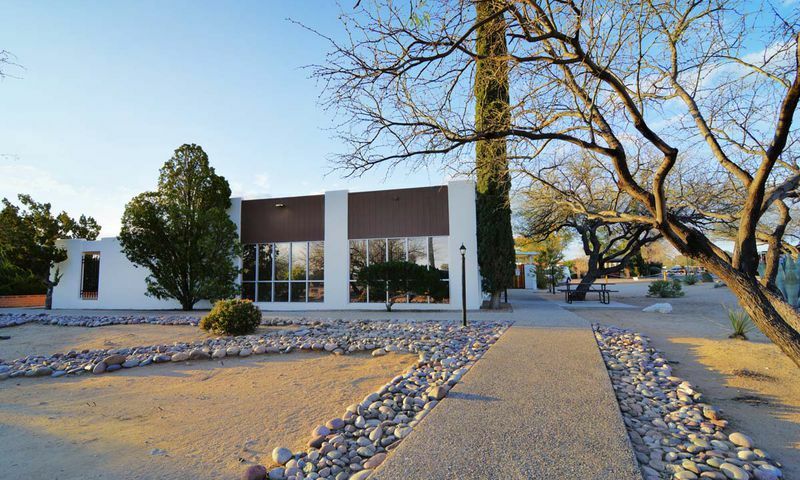 Located just 30 minutes south of Tucson, this active adult community is about 25 minutes away from Tucson International Airport. Traditions at Desert Creek s modern homes and convenient location to I-10 and I-19 makes this a sought after community in Pima County, Arizona. There are plenty of activities available in Traditions at Desert Creek. Here is a sample of some of the clubs, activities and classes offered here. D.R. Horton developed six floor plans for Traditions at Desert Creek that offer 1,198 to 2,161 square feet of living space. These single-family ranch homes offer one to three bedrooms, two bathrooms, and an attached two-car garage. Additional features include a den and private backyard. I was shocked to find out how inexpensive the homes here are. My place was well under $100k and for everything you get it's just amazing. I can use all the different clubhouses in any Green Valley community and I have made a lot of wonderful new friends. The variety of things to do is fantastic. I have really enjoyed trying some new things like photography and ceramics. I always wanted to learn how to take better pictures so that was one of the first clubs I joined. Everyone here is so friendly and encouraging. It's been wonderful! 55places.com is not affiliated with the developer(s) or homeowners association of Traditions at Desert Creek. The information you submit is distributed to a 55places.com Partner Agent, who is a licensed real estate agent. The information regarding Traditions at Desert Creek has not been verified or approved by the developer or homeowners association. Please verify all information prior to purchasing. 55places.com is not responsible for any errors regarding the information displayed on this website.